In a "hot" Multiusos venue (2460 fans attending the game) Ukraine and Portugal provided a more entertaining game since the beginning, in comparison with the previous semifinal won by Spain. Lusitan girls were in control of the game, but Ukraine proved to be "in the game" for 40 minutes, regardless the final score. Careful defense and a good performance by Viktoria Sagaidachna were the keys to keep the score on the goalless state until a shot by Jenny then helped the Janice lead for home idols. Minute 13, harder than expected for Portugal. 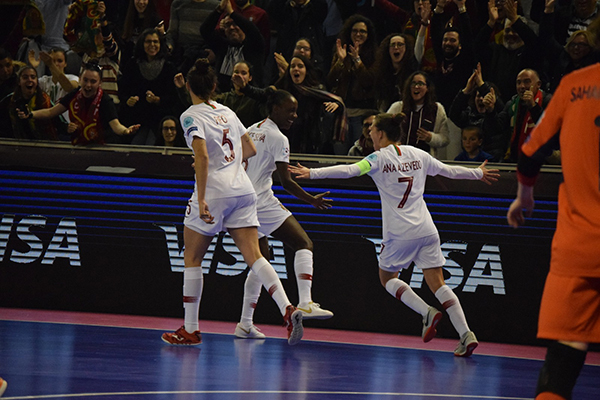 The Portuguese lead remained the same at half time, and while the crowd was hoping to increase it during the second part a perfect counter-attack by Julia Tytova allowed Anna Sydorenko to level the game, quite a surprising score in Gondomar. Portugal was then in need of their youngest talent to change the destiny of the semifinal and confirm the "experts predictions": Fifo shot proved to be too accurate for Sagaidachna, minute 27'. Once restored their confidence in the win, Portugal scored again with Carla Vanessa. Oleg Shaytanov then decided to try the flying keeper tactics through Snezhana Volovenko with Ukraine in a certain moment featuring a record of... six players in the pitch (no bad intentions, just a mistake!). Time to close the game for hosts Portugal: Janice and Fifo signed the final 1-5. Mission accomplished for Portugal, but no regrets for Ukraine that played one of their best games in recent times.